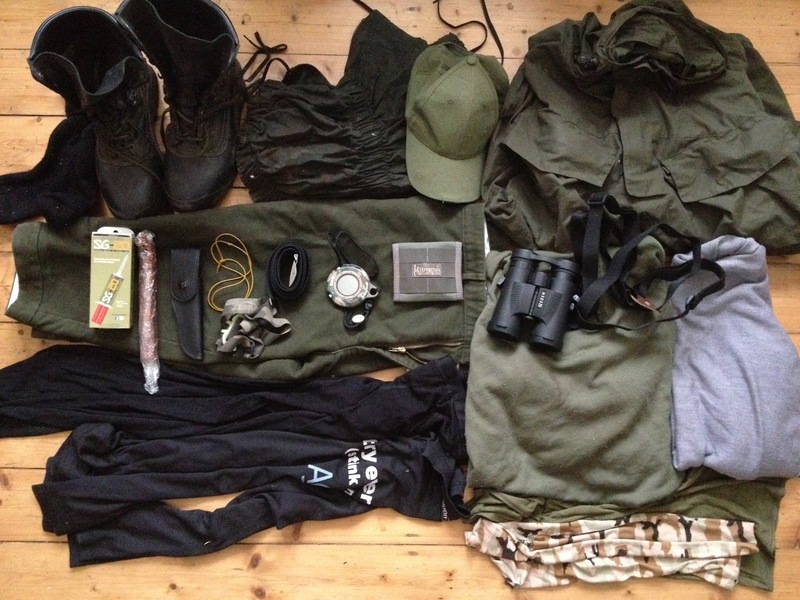 Last time I posted one of these Exploriment asked why I hadn't listed the gear I was to use, so here's the kit list for woodland stalking when you're the 'sport' or client. You're not likely to need a Survival Kit in the woodlands of southern England, but a first aid kit is never a bad idea, and if you do actually contact with deer, those latex disposable gloves are a must. Annoyingly the weather has warmed up a bit in the last couple of days, but so its not really a cold-weather kit or a summer's-morn kit but somewhere in-between. Boots: While Muckboots are ideal I've hurt my ankle so I've opted for Lundhags Ranger boots as I want a bit more support and, optimistically believe we'll be packing big beast out of the woods. Gaiters: keep muck and water out of your boot tops. Essential. Hat: this one has a light in it and came from a bargain supermarket. As well as its camouflaging effect a hat is essential for keeping your rounds together when emptying the rifle. You wouldn't want to drop one from the highseat. WestWinds Arctic Smock: Windproof, amazingly breathable, waterproof enough, and as quiet as the grave. Plus Fours: 'old's cool' I know but once you get over looking a complete dweeb [the deer dont care] these are fantastic. Get a pair you'll be surprised how utilitarian they are. Chorizio: Fatty and Spicy, just what you need to keep you going towards the end of the outing. Binoculars: I'm loving my Eden's and warmly recommend a chest harness over a neck strap. Less than £15/$20 buys you a whole lot of comfort. Or you could make your own in an hour. Neck Gaiters AKA Buffs X2: after Rifle, Glass and Knife these are pretty vital, a lot of warmth and comfort in a very small package for very little cost.